Este artículo también está disponible en Español (this article is also available in Spanish). 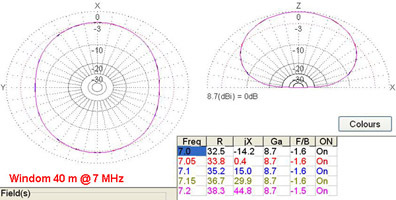 This article describes the characteristics of the Windom antenna and shows the results of several simulations made with MMANA-GAL, covering models optimized for the 20 m, 40 m and 80 m bands. The goal of the simulations is to check the behaviour of the antenna both in it fundamental band of design and in the harmonic bands, taking into account the impedance and the radiation patterns. Remarks: Total length, meters = 142,5 / F (MHz). The antenna is even harmonic resonant. 1. Design and antenna modeling. The Windom antenna (fig.1) is an horizontal antenna composed of two legs with a total length calculated as L = ( 142,5 / Frequency MHz ). The antenna is feeded at a distance of 14 % of the total length, measured from the center point. It is recommended to use a RF choke to avoid currents returning to the transceiver. Fig.1. 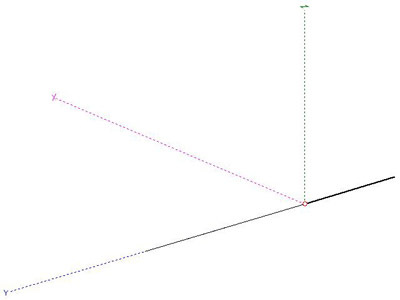 Design of the Windom antenna. The fig.2 shows the antenna modeled in MMANA-GAL. Fig.2. Windom antenna model in MMANA-GAL. This antenna is even harmonic resonant. In this sections the results of the simulations with MMANA-GAL are shown: calculated standing wave ratios (SWR) and radiation patterns for each band. We will consider an antenna designed for the 40 meters band (7 MHz). 2.1. Standing wave ratios (SWR). The fig.3 shows the SWR in the band of design (7 MHz), for a characteristic impedance of 50 ohms. Fig.3. SWR @ 7 MHz for a characteristic impedance of 50 ohms. The fig.4 shows, for this same antenna, the SWR calculated for the first even harmonic (14 MHz). Fig.4. SWR @ 14 MHz for a characteristic impedance of 50 ohms. This section shows the radiation patterns resulting from the simulation in MMANA-GAL. We will follow the same example as before, taking into account an antenna designed for the 40 meters band (7 MHz). The fig.4 shows the radiation pattern in the band of design (7 MHz). Fig.4. Radiation pattern @ 7 MHz. 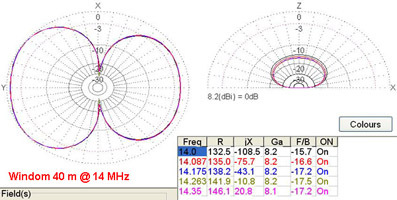 The fig.5 shows, for this same antenna, the radiation pattern in the first even harmonic (14 MHz). Fig.5. Radiation pattern @ 14 MHz. Remember that the simulations are made considering an antenna designed for the 40 meters band. The radiation patterns and SWR calculations should be similar for Windom antennas designed to work in other bands. 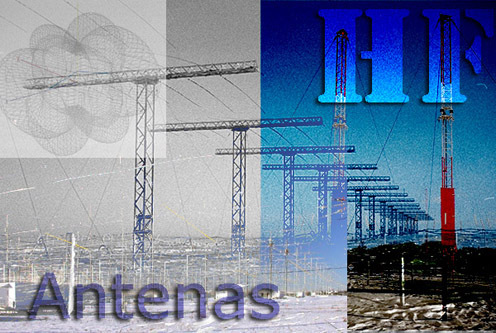 The optimal installation for those antennas to work in NVIS should be made at a height of one tenth of the working wavelength (in this case, an antenna tuner may help to match impedances). To work DX, a higher height of installation is recommended. The antenna is omnidirectional at his frequency of design, presenting a maximum gain of 8,7 dBi. In the even harmonics, tha antenna is bidirectional, with main radiation lobes perpendicular to the antenna's axis, and presenting a worse antenna gain. Excel spreadsheet to calculate the antenna lengths for each possible working band (frequencies of design). (c) 2008-2019 - Ismael Pellejero Ibáñez - EA4FSI - 28T1 || Contact form || Site map || Page last updated: 12/12/2010.